In case you missed the previous article, have a read here which goes into greater detail behind the new VCSA bootstrap installer (also known as vSAN Easy Install) which is part of the new vSAN 6.6 release. As I hinted at the end of the previous post, customers not only have a simplified way of bootstrapping the VCSA on vSAN from a UI standpoint but they can also completely automate this leveraging some of the new vSAN Management 6.6 APIs, which are the same APIs that the UI uses. Step 1 - Connect directly to the ESXi host which you wish to bootstrap vSAN. You will use the VsanPrepareVsanForVcsa() API which accepts a list of disks for either a Hybrid or All-Flash vSAN datastore. Step 2 - Deploy the VCSA like you normally would using the CLI Installer. You will specify the ESXi host that you had just prepared in Step 1 which includes the vSAN Datastore that was setup as part of that process. Step 3 - Once the VCSA has been successfully deployed, you will connect to the vCenter Server and use the VsanPostConfigForVcsa() API which will create a vSphere Datacenter, vSphere Cluster and enable it with vSAN (which can also include Dedupe/Compression if you are using an All-Flash setup) and then automatically add the ESXi host that you had just bootstrapped. If you have provisioned other ESXi hosts that have not been configured with vSAN, you can also include that into the API request. The really nice thing about this "post" API is that rather than having to call into several existing vSphere APIs to setup vCenter Server, you can do all of that just using this single API! To help demonstrate the use of the these new vSAN Management APIs, I have created a simple Python script which exercises these new APIs called vsan-vcsa-deployer-sample.py The script supports three operations: listdisk, prepare and post. python vsan-vcsa-deployer-sample.py -s 192.168.1.100 -u root -p VMware1! 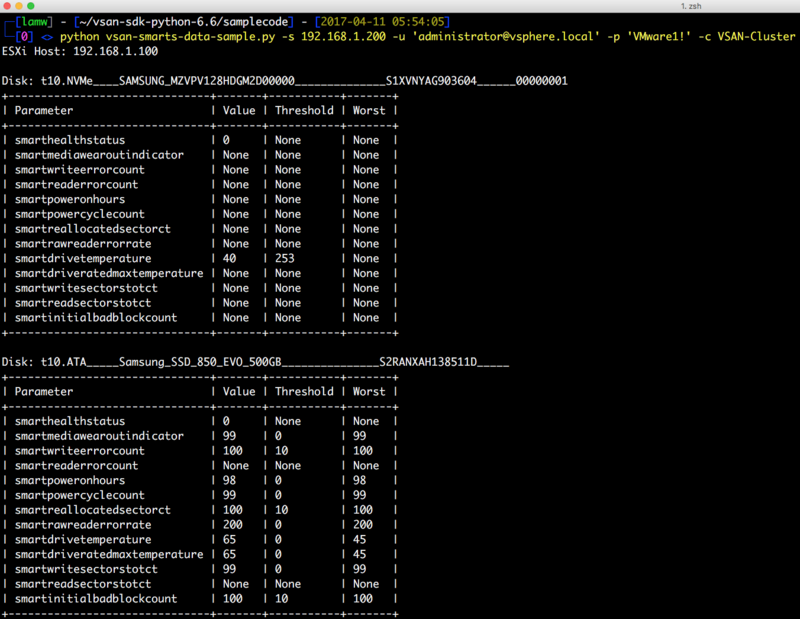 --operation prepare --cache "SAMSUNG MZVPV128" --capacity "Samsung SSD 850"
python vsan-vcsa-deployer-sample.py -s 192.168.1.200 -u 'administrator@vsphere.local' -p VMware1! --operation post --datacenterName "VSAN-Datacenter" --clusterName "VSAN-Cluster" --esxName 192.168.1.100 --esxUsername root --esxPassword VMware1! Once the post operation has completed, you will have a fully configured vCenter Server which you can check by logging into the vSphere Web Client. Pretty slick, if you ask me! While going through the PowerCLI 6.5.1 release notes last week, in addition to the new Get-VsanView cmdlet which exposes the complete vSAN Management API through PowerCLI, I had learned that we had also released a new Get-VsanStat cmdlet. This new cmdlet allows customers to easily retrieve the various vSAN Performance Metrics provided by the vSAN Performance Service. The really nice thing about vSAN Performance Service is that all vSAN stats are now available directly in the vSphere Web Client, where as before, this information was only available as part of the vSAN Observer which was a completely different interface. The other huge benefit to using the vSAN Performance Service is that it also stores the historical stats compared to the vSAN Observer which was primarily used for real time troubleshooting. As of vSAN 6.6, the vSAN Observer has been deprecated and will only be used by GSS in limited scenarios, everything you were able to do with the vSAN Observer is now possible with the vSAN Performance Service. While trying out the new Get-VsanStat cmdlet, I had found it to be quite difficult to easily map the vSAN metrics I saw in the UI to the specific PowerCLI query required to extract that information. The documentation was also quite light and only included a single sample and although some of the metrics could easily be deduced, there were many others that I was just unsure of. I had also tried using the vSAN Management API directly, thinking that I might have more luck but it was also challenging to use for other reasons and I still ran into the same problem which was how do I easily map what I saw from the UI down to the API or even associating that back to PowerCLI. After spending a few days with BOTH PowerCLI and the vSAN Management API and with a bit of frustration, I think I have finally figured out how to map what I saw from the UI back to the both CLI and API. This was not an easy task as and I had to cross-reference multiple datasources to build up this mapping and I thought I would put together a reference which outlines this mapping so that others would have to go through the same pain. IMHO, this should be a pretty straight forward task. In addition, I have also provided a PowerCLI sample for each of the metric types as well as the associated vSAN Management API mapping as those differ in name as well. This hopefully should make it easy for anyone to start using either of these interfaces for collecting vSAN metrics from an Automation standpoint. As part of this exercise, I also ran into a variety of bugs which I have already filed internally and all this information has been feedback to Engineering teams to hopefully improve both our CLI and API in future updates. 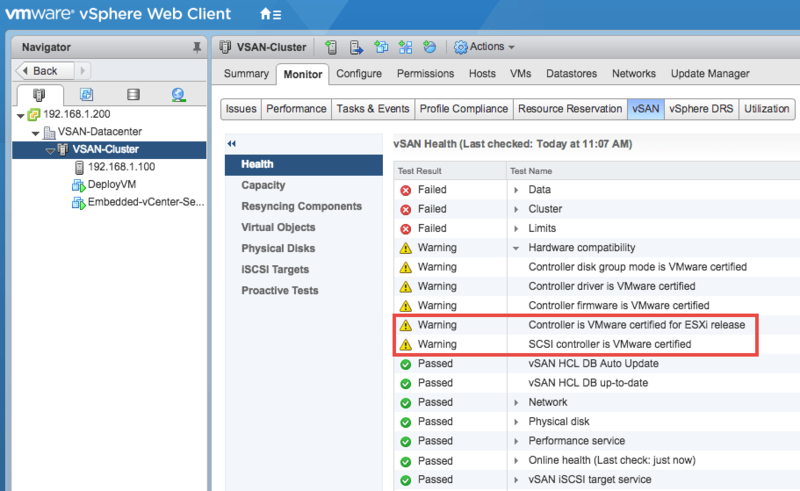 One neat capability that was introduced with vSAN 6.6 is the ability to "silence" and disable specific vSAN Health Checks. A recent use for this came up on Duncan's blog where the vMotion health check would fail if you are using a vMotion network stack. As you can imagine, this feature can also come in handy for vSphere Home Labs where your hardware may not be on the official VMware HCL and wish to disable those specific vSAN Health Checks. One of the things that I am most excited about from an Automation standpoint with the vSAN 6.6 release is that customers using PowerCLI will now have complete access to the vSAN Management API which we had initially introduced back in vSphere 6.0 Update 2. In PowerCLI 6.5R1, customers only had access to high level vSAN cmdlets which did a pretty good job covering the broad set of vSAN functionality. However, it did not expose the complete vSAN Management API and this has been something many customers have been asking about. With the new PowerCLI 6.5.1 release, a new Get-VsanView cmdlet is now available that will exposes the complete vSAN Management API using PowerCLI. Since the vSAN Management API has been around since vSphere 6.0 Update 2, you will also be able to use this new cmdlet against a vSAN 6.2, vSAN 6.5 and vSAN 6.6 environment! 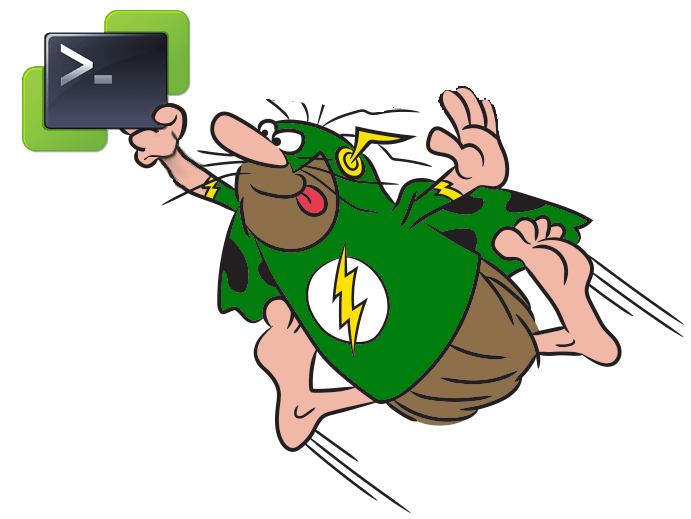 You simply just need to update your PowerCLI installation which you should always do to get the latest fixes and enhancements. When you connect to either a vCenter Server and/or ESXi host, you will be able to view all available vSAN Managed Objects for the system by simply running the cmdlet without any arguments as shown in the screenshot below. If you wish to access a specific vSAN Managed Object type, then you will need to pass in the vSAN MoRef ID from the given list. Here is an example of accessing the "VsanVcClusterHealthSystem-vsan-cluster-health-system" which will give us access to the VsanVcClusterHealthSystem. One of the major storage enhancements that was introduced in vSphere 5.1 as part of the new I/O Device Management (IODM) framework was the addition of SMART (Self Monitoring, Analysis And Reporting Technology) data for monitoring FC, FCoE, iSCSI, SAS protocol statistics, this is especially useful for monitoring the health of an SSD device. Historically, there was not a public vSphere API to consume this information and customers had to rely on ESXCLI which is not very friendly from a programmatic standpoint. One of the nice enhancements that was introduced in vSAN 6.6 from an API standpoint is that you can now access SMART data using the vSAN Management 6.6 API. The other really cool thing about this enhancement is that although this API was added under the vSAN Management API, you do not actually have to be using vSAN to be able to use this new API! 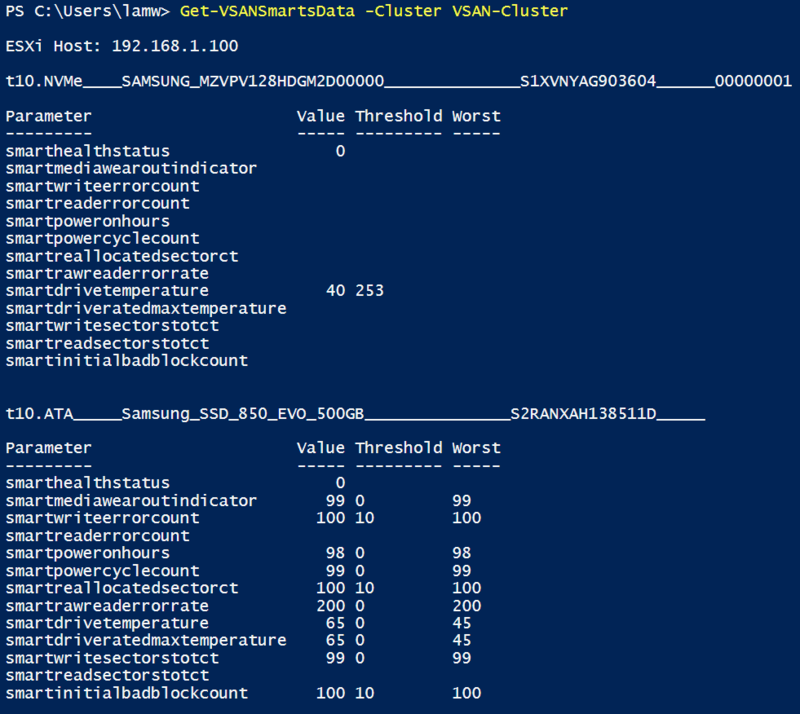 vCenter Server - When connecting to a vCenter Server, you can access the VsanQueryVcClusterSmartStatsSummary() method which is available as part of the VsanVcClusterHealthSystem and you simply just provide it the name of a vSphere Cluster. ESXi Host - When connecting directly to an ESXi host, you can access the VsanHostQuerySmartStats() method which is available as part of the HostVsanHealthSystem. To demonstrate how these two new APIs work, I have create two sample scripts: vsan-smarts-data-sample.py using vSAN Management SDK for Python and VSANSmartsData.ps1 using the new PowerCLI Get-VsanView cmdlet.